Setting Sail and Celebrating Centenaries! 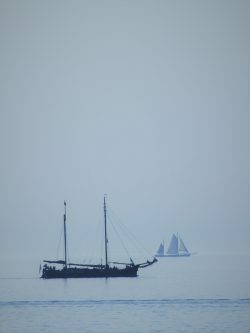 Parry’s Never Weather-Beaten Sail is a setting of an early 17th Century text by composer, poet and doctor Thomas Campion, in which the allusion to the ship is metaphysical. The Blue Bird is a setting by Parry’s great contemporary Sir Charles Stanford of words by Mary Coleridge and is now one of his most popular pieces. Judith Bingham ‘deconstructed’ it to provide the musical material for The Drowned Lovers – in which the blue of the sky is glimpsed from below the surface. The JCS gave its first performance at the Three Choirs Festival in Hereford Cathedral in 2000 with Lorna Perry as soloist– Lorna will be our soloist again in Cornwall. Our musical voyage north-eastward visits Hamburg as we perform Brahms Fest- und Gedenksprüche (Festival and Commemoration Sentences), composed in response both to his recognition by the city as an honorary citizen and to the then-recent unification of Germany. The music is suitable for commemorative national festivities – which links neatly with our marking the Baltic States’ centenaries. Latvian composer Ēriks Ešenvalds is represented by his graphic description of the Northern Lights (a piece that includes the ethereal sounds of tuned wine-glasses!) and his arrangement of the traditional hymn Amazing Grace, the words of which were written by John Newton in the mid-18th Century after he had just survived a vicious storm. The destructive potential of the sea is ever with us – we shall sing the remarkable and solemn Canticum Calamitatis Maritimae by Finnish composer Jaakko Mäntyjärvi, which marks the sinking of the car-ferry ‘Estonia’ in the northern Baltic Sea in 1994 with the loss of 910 lives. Elements of lamenting for lost lives occur also in Jūras Dziemas (Songs of the Sea) by Latvian composer Pauls Dambis, which all relate to the times of oppression under the Soviets. Our programme has Lithuania represented by Vytautas Miškinis – one of the leading choral composers of his country – and Estonia by the major figure of Arvo Pärt as we sing his uplifting Morning Star, which takes as its text the prayer found above the tomb of St Bede in Durham cathedral. Venue and booking details for our concerts are here. Do join us on the voyage!